Watch the video above to know what to expect during our home visits! Bryant Mobile Veterinary Care provides convenient, quality and compassionate Veterinary Care in the comfort of the client's home where the pet is relaxed and happy. Dogs and cats are most likely to heal and be healthy in a place where they feel safe and secure. Dr. Kate Bryant opened Bryant Mobile Veterinary Care after realizing a distinct need in this community to make Veterinary Care more accessible. Bryant Mobile Veterinary Care promises to treat each client with respect and each patient with compassion. 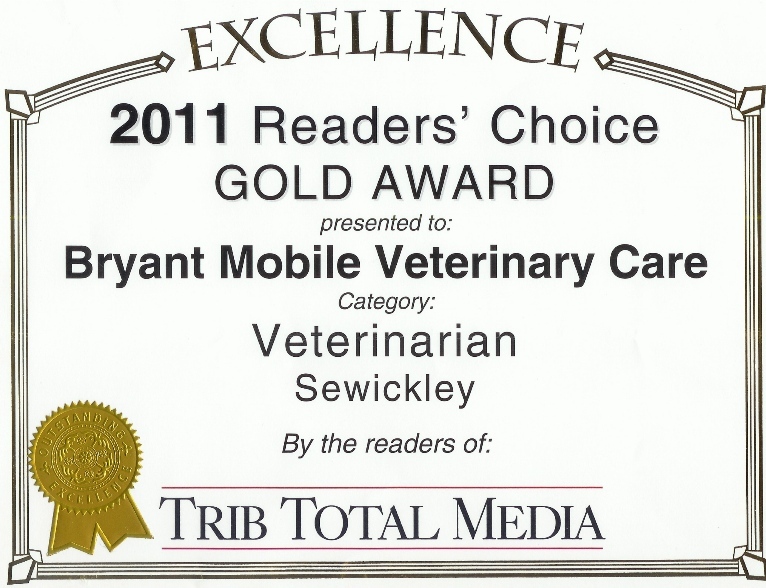 Bryant Mobile Veterinary Care services Wexford, Sewickley, Cranberry Twp., PA, and nearby areas. This is not an emergency service. Please call or email to schedule an appointment. Phone calls, emails and texts are answered Monday through Thursday from 9 a.m. to 5 p.m.
At Bryant Mobile Veterinary Care, we treat your pets like the valued family members they are. Please leave a message, as we might be assisting other patients at the time you call. Serving the Wexford, Cranberry Twp., Sewickley, and nearby areas. After Graduating from The Ohio State University, College of Veterinary Medicine in 1996, Dr. Kate Bryant has worked as a veterinarian in both small animal medicine and surgery in Pennsylvania and Ohio. Bryant Mobile Veterinary Care was started in 2010 to allow pets a chance to receive preventative care, diagnosis, treatment for illness and end of life care in a more relaxed home setting. No forms are currently available. "Just had my first visit with Dr. Bryant. It was fantastic. She was so nice & made us as well as our lab Finn very comfortable. A wonderful experience. Thank you!"